Around 1915 Simon Glaser opened a drug store in Athens, Pa. In 1921, he moved his store to 121 West Packer Avenue in Sayre. 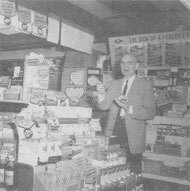 He, and later his son Sidney, ran Glaser's Drug Store until 1961. It was first "Cut Rate" and then, for many years, a "Rexall" store. Drug stores in the 1920's were primarily "drug" stores, but veterinary supplies were an important part of the business, especially medications for farm animals. Over the years, school supplies and cosmetics became an important part of the business. By the 1930's a wonderful soda fountain with 10 seats and booths for 30 persons was added. "Maggie" Hollings made home-made ice cream daily and continued until the early years of World War II when sugar was no longer available due to rationing. Later, Glaser's got a Breyer's Ice Cream franchise. It was a part of drug stores in the 1920's to sell paint and wallpaper. Glaser's had a wallpaper "barn" in the alley behind the store, stocked with hundreds of rolls of paper. Ceiling paper was 75 cents a roll and patterns sold for $1.00 to $1.25. Wallpaper books for special orders weren't stocked until sometime in the 1940's. Mr. Glaser's daughter had one of the first "special order" patterns in her bedroom. That paper retailed for $2.00 a roll! But, that was at a time when cigarettes like Lucky Strikes were 10 cents a pack, and in the mid-1940's, sold for 18 cents a pack. Sid's children, Joe, Mollie, and David, all loved working in the drug store when they were old enough and "hung out" there with their friends when they were young. You have a lot of friends when your father has a soda fountain! Single dips of homemade ice cream with fresh fruit were 5 cents and later 6 cents. A double dip cone was a dime. In 1961, when Sid's wife Marion ("Pete") was seriously ill, he sold his beloved store - open from 8 a.m. to 9:30 p.m. and until 1 p.m. on Sunday - and retired. Marion died six months later and Sid built Penn York Lanes bowling center so he could continue working his 60 hours a week until he finally retired at the age of 86. Hook's American Drug Store Museum which will open in Indianapolis, Indiana in 2001. There will be special sections from Glaser's Drug Store. The museum will cover drug store history from 1880 to the present and will have two soda fountains, one from 1890 and one from 1940.